The latest in easy to use compost bins. 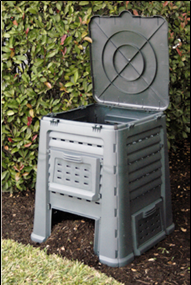 composter performs its useful task: composting vegetables, fruit, and garden waste. well placed air slots guarantee optimal composting conditions. The same clips used to keep the lid in place also make it possible for the lid to stand straight up (by itself) when loading the composter. All the side panels have the same two “lid-grabbers” (hinges) at the top which hold the lid in place and make it much less likely for the lid to open up easily – like in a wind or by an animal. Their lids have a flat design with reinforcement ribs – for added strength. Affordable composters from Germany with features of more expensive models. All the side panels have the same two “lid-grabbers” (hinges) at the top which hold the lid in place and make it much less likely for the lid to open up easily – like in a wind or by an animal. Well ventilated all around for good air flow and faster composting. Shipping will be added. FOB Austin, TX. 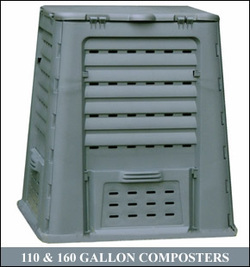 160 gallon large garden composter. Shipping to be added.